Living in Portugal is a breath of fresh air, it’s an experience that cannot be matched and as soon as you arrive, you will be tempted to start enjoying it from day 1. The best thing about living in this magical country is that you will always feel inspired. Just picture yourself waking up in the morning and the first things you see through your window are all the hills surrounded by brightly coloured beaches, while you feel the breeze of the ocean and the warmth of the sun on your face. While your home is a peaceful oasis, right outside your doorstep are charming pedestrian villages boasting great restaurants, quaint shops, cafes and bars where everyone knows your name, along with a wonderfully gracious atmosphere and easy access to the city. The Portuguese bustling cosmopolitan cities are world famous for their safety and cleanliness. Filled with marvellous museums, theatres, galleries, restaurants and historical sites, just walking around the city centers gives you a sense of history and timelessness. A country with unsurpassed natural beauty and fascinating stories, that offers an extensive array of properties in gorgeous settings, and where culture can be seen everywhere. Surrounded by absolute serenity, Portugal breeds harmony and peace. Aside from its diverse and incredible landscape, which can become your background and ranges from stunning ocean views, to vineyards, mountains and countryside homes, Portugal provides you with a multitude of golf resorts, city apartments and condos. Home to an array of natural wonders and cultural treasures, where innovation and tradition co-exist in harmony, Portugal presents a wide set of activities including sightseeing, shopping, relaxing at the beach, golfing, sea life watching, hiking, excellent dining, and unparalleled wine tasting. 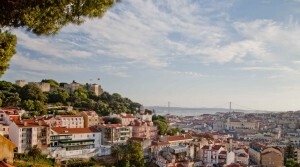 Due to the wondrous generosity and hospitality of its locals and to the multitude of cultures, religions, and languages, Portugal is a destination chosen by thousands of foreigners, expats and retirees, so you are bound to meet people from your own city and/or country, as well as other international residents and visitors. Living in Portugal is like being on a permanent vacation. Because of the close proximity between the North and South of Portugal and due to the country’s modern road network, it only takes three/three-and-a-half hours (at most) to get from Lisbon to Oporto or Faro. So you can visit the major cities pretty easy and enjoy them with time. Portugal offers unnumbered magical routes and circuits throughout the country, providing you with plenty of transcendental places to explore. Portugal is a land of historical and cultural treasures, beautiful rivers and streams, abundance of species and wildlife and is the home of rugged coast and great mountain views. Some of the most scenic driving routes the country has to offer are: the route to Serra de Sintra, to Portinho da Arrábida, throughout Costa Vicentina, all over the Alentejo or across the mountains right up to Gerês. One of the best ways of seeing these incredibly beautiful environmental and cultural treasures is by road. In Portugal, highways connect all large and small urban centers and most rural areas so when driving north, you must stop at the Douro region and explore one of the world’s most stunning landscapes created by man. For business or pleasure, you can rent a car just about anywhere throughout the country. There are many car rental companies, so it won’t be difficult to find one that fits your personal style. Portugal is definitely one of the singular places in the world where you can touch history and simultaneously get the feeling that history is still being made. The country boasts several UNESCO World Heritage natural sites and a rich cultural, culinary and nightlife. Start living in Portugal and you will soon understand how impossible it is to resist its mesmerising charms and long lasting beauty.